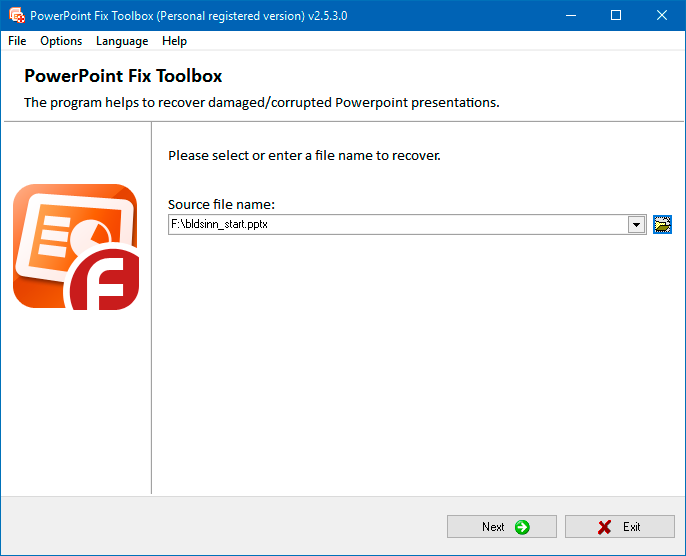 PowerPoint Fix Toolbox is an effective tool for recovering damaged presentations created with Microsoft PowerPoint. PowerPoint Fix Toolbox helps to fix PowerPoint file any version. Support for all versions of Microsoft PowerPoint. Uses artificial intelligence to recover PowerPoint 97-2016 format files. Recover graphics objects, text, styles, and paragraph effects. Save media files as a separate directory (video, music, etc.) if they cannot be inserted into the new presentation. Export recovered slides directly to Microsoft PowerPoint. 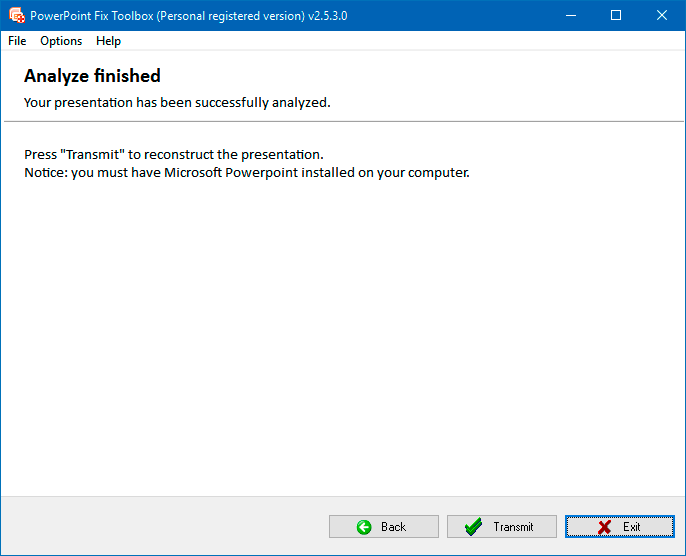 The corrupt PowerPoint fix tool analyzes and extracts data from faulty *.ppt and *.pptx files. Note: The program is not licensed under GNU General Public License (GPL) or GNU Lesser General Public License (LGPL). PowerPoint Fix Toolbox is not open source software or a freeware tool. 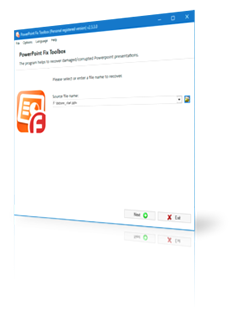 PowerPoint Fix Toolbox is distributed on the try-before-you-buy basis with a free DEMO version. Requirements: for PPTX Fix Tool: You need to have Microsoft PowerPoint installed on your PC. 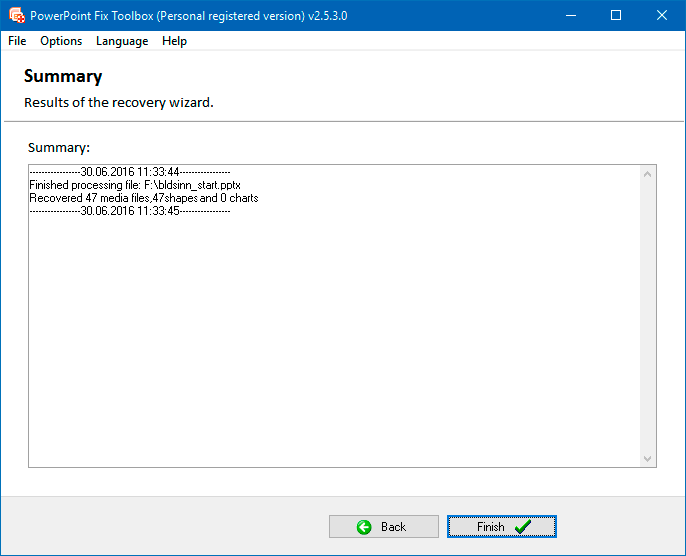 The PPT Fix tool does not recover password-protected *.ppt or *.pptx files. If PowerPoint Fix Toolbox cannot insert media objects (images, video, Excel tables, etc.) directly into the presentation, they will be saved as a separate directory. Selection of a damaged file. Analysis of the damaged presentation file and extraction of media files. Transfer of the recovered files to PowerPoint.